It can be hard to know where to begin in giving your garden a fresh start. Overgrown shrubs, faded patio furniture, and areas that lack any kind of visual power (beyond the “yuck” factor!) can make it hard to know where to focus our energies, especially if we know we can’t tackle everything at once. As a designer, there are a few tricks I use to simplify the process of choosing what to do first. Do you sit on your patio a lot, or go to and from your car, or look through a particular window every morning with your tea? Over the next few days, pay attention when you see your garden. Make a little “ping” go off in your head each time you notice your garden out a window or walk through it, and just take note of what you’re feeling and seeing. That flurry of activity in your mind? Not helping you gain clarity. Breathe deep and let go of your attachment to any particular type of outcome or project. You want a clean mental slate so that you can see what is, right now. I mean, step far back. I don’t want you to be able to micro-focus on to-do’s or details. Once you’re backed up as far as you can go, squint so hard that your eyes go blurry. What do you see? What’s the big picture? Try to listen to your first gut reactions. Maybe a certain plant is overwhelming everything. Maybe everything’s all the same height and something tall or dramatic is in order. Or maybe everything blurs into a boring amalgamation of medium green or medium-fine texture. Don’t pressure yourself to come up with solutions right away. If you focus first on seeing what is really going on with your space, and give yourself the mental room to just notice, then the solutions will come. If you’re having trouble gaining insights from the back-up-and-blur method, try taking black and white digital photographs of each area. 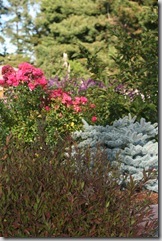 You’ll be surprised how differently you see your garden when the distraction of color is removed. More on that here and here. Paint patio furniture, trellises, and structures: And don’t be shy about trying out bold colors. If you hate it, just try again. 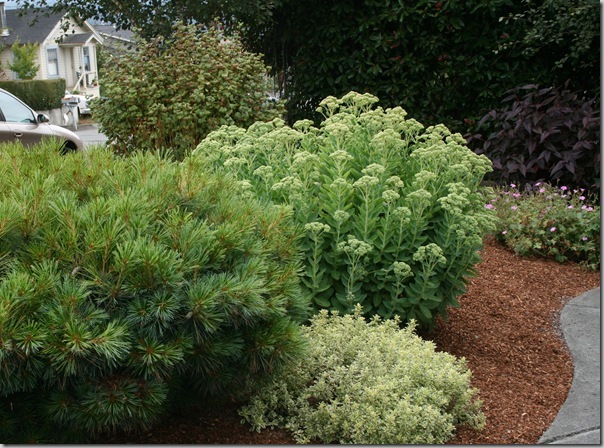 Put out a fresh layer of mulch or gravel: Nothing makes a garden look clean and cared-for like a fresh layer of wood chips, compost, or gravel. Plus, if any areas of your garden are continually sprouting tiny baby weeds, a thicker layer of mulch will help. Remove overgrown shrubs, or prune them: If you can’t decide between removal or pruning, check out Pruning and Training by Brickell and Joyce. As long as you know the name of your plant, you can look it up to see what kinds of pruning your plant will respond well to. This book can give you the confidence to dig in and renovate a mature shrub instead of just living with its inappropriate size or shape. A bit of pruning and mulch make a dramatic difference. Focus on edges: It’s true – if you neaten up the edges, you fool the eye into thinking the rest of the bed looks neat as well. A clean line between bed and lawn can make a huge difference in how your garden looks. Use repetition to help an area recede or become bold: Masses of low, finely-textured plants make an area feel soothing, and can make it recede into the background. Repetition of taller plants with more boldly-textured foliage can lead people’s eyes to that area. This is useful if you want people to slow down along a path, look at a focal area, or feel right in the thick of things when they’re sitting in your patio. Ask for help: If you’re feeling stuck on an area or issue and need a new set of eyes, garden coaches and landscape designers can bring some fresh perspective, give you confidence in your decisions, and provide innovative solutions to tough challenges. Your post has so many great ideas in it for renovationg a garden. I love the suggestion to ‘calm your mind’ and not to rush the solutions because eventually they will come to you. And the use of B&W photos is genius. I followed your links and was amazed at the difference between the color and b&w photos of the same vignette . Who knew seeing plants in color was obscuring my view? Lots of really useful tips here. When appreciating art at school we were taught to squint exactly how you are saying. And gardens are art, right? I might approach our next job in a new way. The only problem is the quinting doesn’t half make your eyes ache! Fabulous suggestions, Gen! Like Robert, I also loved the “squint”. And the EDGES – YES! Such great advice – I’m going to take alot of it and use it MY garden, which is in dire need right now. This post couldn’t have come at a better time for me! Wonderful, practical suggestions for all! Love your advise to forget the details and solutions—those will come—and just listen to your gut first. Thanks for the great tips! I like it.. nice and simple and effective. I am in total agreement about paint. (A lot of other things too) Paint is the least expensive most fun change you can make in a renovation. Most people can afford a quart of paint, a brush and a Saturday afternoon. What a difference it can make. I’m reminded of a successful landscape architect who taught me to look at things out of focus like that as well. He’d say “almost cross eyed”. I’ve only heard a few others mention it until now. Great post. Doing these few steps would really be easy and inexpensive to bring a garden or landscape back to life. I need to do a number of these simple projects myself: paint furniture, lay fresh mulch, etc., etc. I just can’t seem to find that free Saturday afternoon! Gen, this is an AWESOME post! Of course, at first I liked it because as I read I was nodding along, thinking “I do that!”, but then I got to the suggestion to step back and view the garden through blurred eyes. I never considered this but it sounds like an excellent way to force yourself not to focus on little details. And thanks for the shout-out on not being afraid of bold color – although if you want to get your garden in a traditional magazine you should probably be a little afraid. Although Fine Gardening included a photo of it last month, the publicist for the book I’m writing for Rebecca sent a photo of it to BHG as part of a companion story idea, and let’s just say the editor wasn’t too enthusiastic about a purple wall gracing the pages of their magazine! Debbie – isn’t that black and white idea great? I just loved that series on Gardening Gone Wild. Loads of inspiration there from all their bloggers! Robert – I’d sure say so! My partner Trevor is an artist and he’s the one who taught me that trick. I couldn’t believe how it helped me see the bigger picture. Jocelyn – I think we have more wisdom than we give ourselves credit for – it’s just a matter of calming the mantal chatter long enough to listen for it! Miss R – I am taking that advice myself. I have a chicken coop that is not yet purple. Must still negotiate color with aforesaid partner who prefers blue and gray! Steve – almost cross-eyed totally covers it!! That’s a great way to describe it. Susan – I cannot believe BHG didn’t immediately see the glory of that purple wall. I adore your wall! Adore it! It’s one of the prettiest and most inspiring uses of color I have seen all year. I think they know their audience and maybe it’s not for them, but I can tell you – this is why I am SUCH a fan of Fine Gardening. They aren’t afraid to show something a bit wild. And while I think that normal, beautiful gardens are lovely to look at and be in, in person, in a magazine I want a little extra!! I want to be inspired! Your wall did that for me. As an artist and garden designer I’m a major squinter. It is amazing how this technique works so well. I also prefer designing and painting from intuition. You’ve given a lot of inspirational and practical ideas to consider when renovating. Wonderful suggestions for clearing your mind and viewing your space Gen! I especially like the black and white and squinting tips, and am going to give them a try. Thanks for the inspiration! As usual, a most excellent post Gen! I love that you really emphasize the importance of ‘calming your mind’ and giving yourself the ‘mental room’ to just notice! For me, that’s the most important step of all when coming up with new ideas. You have such a great way of explaining things that may otherwise seem a little confusing. You’re such a good teacher! Pam – don’t we all need that extra Saturday afternoon! I’m with you. Carolyn – I’d love to read a post one day about how you design and paint from intuition. That sounds absolutely intriguing! Rebecca – I think we underestimate ourselves, and so often have the right answers at our disposal. It’s just hard to become still enough to hear that little whisper of inspiration sometimes! Beautiful tips and generous pictures….so inspiring! Great post! Something I’ve often done in my own gardens,but never really thought about.Fresh mulch, and trimming the plants makes a big improvement. Sometimes you have to change plants around to get the right color combinations. 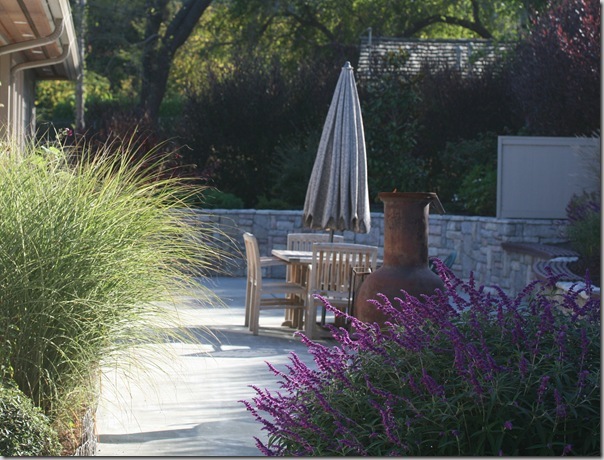 Adding some ornamental grass to an otherwise plain area is usually a big help.